Among rural Sinhalas, the belief that former president Mahinda Rajapaksa was cheated out of a victory in the last presidential election held in January 2015 resonates strongly. Many even believe that Rajapaksa’s defeat was a conspiracy hatched by the western powers. Apparently, these voters were largely responsible for the victory of the political party backed by Rajapaksa in the local government poll held on February 10. The poll result has in a way put him back in the driving seat and plunged the coalition that ousted him from office into disarray. Rajapaksa’s party won nearly 45 per cent of the total votes cast while the United National Party (UNP) of Prime Minister Ranil Wickremesinghe, the single largest party in parliament, came second, polling around 33 per cent of the votes. The showing by the two parties backed by President Maithripala Sirisena was dismal. He managed to win less than 15 per cent of the vote. While losing a local council election does not result in the downfall of a government, many see it as a referendum on the popularity of the ruling coalition put together by Sirisena and Wickremesinghe after they ousted Rajapaksa. The electoral setback plunged the already faltering alliance into turmoil with immediate calls for Wickremesinghe’s resignation and a snap parliamentary election. As most political analysts have pointed out in the aftermath of the polls, containing Rajapaksa has proven to be a tough challenge for Sirisena-Wickremesinghe. “His political opponents were not in the same weight class as this Muhammad Ali of politics,” wrote political analyst Dayan Jayatilleka. While his views are usually pro-Rajapaksa, this poll result signals the return of the former president under whose tenure the Liberation Tigers of Tamil Eelam were militarily defeated. This may not be a welcome scenario for the liberals among the Sinhalese population, the Tamil and Muslim communities, who together comprise 23 per cent of the country’s population of around 21 million. Rajapaksa’s ardent supporters mostly belong to the majority Sinhalese Buddhist community. Tamil politician and leader of opposition Rajavarothiam Sampanthan, who leads the Tamil National Alliance, has criticised the communal line that Rajapaksa took during the election campaign by saying that a vote for the UNP would lead to the creation of a separate Tamil state. “It was a malicious, vicious, fallacious, false propaganda,” he says. Rajapaksa left office in 2015 amidst a barrage of allegations ranging from human rights abuses, nepotism, fraud and corruption. People complained of a repressive regime run by Rajapaksa and his brothers. Amid international pressure, mounting debt and public outcries over abuse of power, Rajapaksa declared an early presidential poll aimed at fortifying his position but unbeknownst to him, Sirisena, one of his closest associates and minister, was roped in to run as a common candidate against him. The gamble paid off and Sirisena was elected the president with the backing of the Tamil and Muslim voters. However, the government of National Unity put together after Rajapaksa’s defeat has been fraught with ideological differences. The Sri Lanka Freedom Party (SLFP), the leadership of which Sirisena took over, is a Left-leaning party that has historically forged alliances with China and Russia and spearheaded the Non-Aligned Movement. The UNP is a right of the centre party with leaning towards the West. 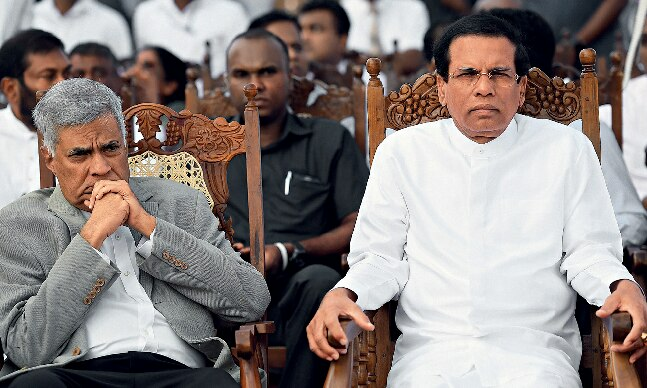 Sirisena and Wickremesinghe also come from contrasting backgrounds-the former hailing from the rural agriculture district of Polonnaruwa while Wickremesighe hails from an affluent family in Colombo. The two had formulated a common programme with promises to bring back the money allegedly siphoned off abroad by Rajapaksa, curb corruption, restore human rights and address war crimes allegations levelled at the armed forces. However, the probe into allegations of corruption against those in the former regime have dragged on without breakthroughs. Further, the PM’s close confidant, who was appointed governor of the Central Bank, faces charges of sharing confidential information with his son-in-law on the sale of bonds, which resulted in a huge loss to the state exchequer. Sirisena appointed a presidential commission before which the PM had to appear as a witness. This caused a rift between Sirisena and members of the UNP who accused him of going against the party that helped him to come to power. Promises to move away from Rajapaksa’s pro-China policy have been all but forgotten with the controversial Port City project, which Wickremesinghe had promised to scrap once in office, going ahead full steam. The Hambantota Port, too, has been handed over to a Chinese company amid protests from local workers. The bitterness among the coalition partners was reflected throughout the campaign. Instead of focusing on Rajapaksa, Sirisena accused his alliance partners of corruption. The UNP members, on the other hand, slammed him for ‘ingratitude’. This, coupled with people’s anger over rising cost of living, cutbacks in fertiliser subsidies and allegations of corruption against ministers, worked in favour of Rajapaksa. In the aftermath of the poll, the government looked shaky for a few days but its members have since rallied behind the president and the prime minister. “The future plans of the government will be implemented for the betterment of the public while taking into consideration the message given to the government,” the president said after a recent cabinet reshuffle. The PM admitted that the ruling alliance had suffered a major setback. “We accept the people’s verdict…. We will look inwards,” he said. The country’s constitution bars anyone from running for president for more than two terms. Hence, Rajapaksa cannot contest for the post. He is a member of parliament and if he can muster the support of a majority, he could become the prime minister. This seems unlikely given that the UNP and Sirisena have the majority in parliament. Presidential and parliamentary polls are due in 2020 and, elated by the recent success, Rajapaksa would have set his sights on regaining power. Sirisena and Wickremesinghe would do well to stop their bickering. Otherwise, their prospects don’t look too bright.